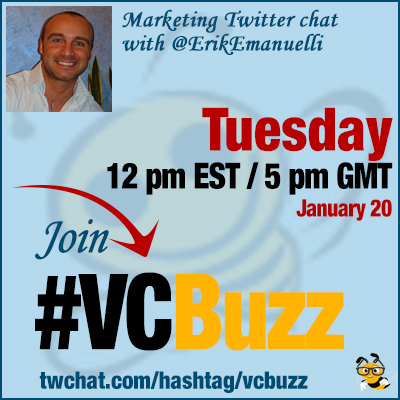 Today at #VCBuzz Twitter chat we are learning an important lesson: How to build your own (mini-)community. I hope we’ll be able to use some of the tips to build @MyBlogU as well!
. @ErikEmanuelli is blogger, traveler and freelance writer. Erik is also an extreme sports lover and he is now learning how to skydive. Q1 Erik, please tell us how you ended up being a blogger and online marketer? What’s your story? After 6 years in banking field and 7 as Export Manager, I was “forced” to search the net for “making money opportunities” (Economic crisis + recession = latest company I worked for in serious difficulty). So I started blogging! Q2 Are you earning your life online or do you also have a day job? I’m a blogger since 5 years. Professional since 2. Freelance writer since last year. Now earning full time income online. Selling banners works for me, plus sponsored posts are a great way to monetize a blog. Lately freelance writing. Yes, at beginning. But that’s a blood bath! Luckily I collaborate now with a content marketing agency. Q3 Why did you decide to start building your own community @klinkkdotcom? What inspired you? How is it going? How are you building it? I founded @klinkkdotcom in October 2013:the idea was creating a meeting point for bloggers of different niches. Built on PLIGG CMS, @klinkkdotcom is going pretty good. +2500 users, natural backlinks flowing, good social signals. Let’s see if @klinkkdotcom will take off! You know better than me,a lot of work is needed to launch a new project! A simple to use platform is needed + engagement with users. Gamification really works! Q4 How can a blogger build a community around his/her blog? Why building it is so important? Engaging with readers,answering to comments,learning from each other,creating new connections with bloggers. @adriennesmith40 taught me the importance of building a community around my blog: traffic, loyal fans, friendships. Q5 Being extreme sports lover, how do you maintain balance between your hobbies and online career? What are your productivity tips? I do gym 3 times a week, jogging once, skydiving once every 2 weeks : “mens sana in corpore sano” 🙂 I’ve set working hours, upon reaching daily goals. I work on priorities: first most important. I’m old school:sticky notes on desktop+organized folders in PC/email.